Our old nemesis, the clap, is in the news again this month. Gonorrhea is the second most common sexually transmitted disease in the US, with more than 600,000 cases annually. In men it usually causes pain on urination, penile discharge, or sore throat. In women it may not cause symptoms or may cause painful urination, vaginal discharge, or sore throat. If untreated, gonorrhea can spread to the fallopian tubes, joints, and heart valves. I know that most readers simply can't hear enough about penile discharge (especially if they're reading this over lunch), so to the right I've included a microscopic image of exactly that. The gonorrhea bacteria are visible as the small dark dots. With the discovery of penicillin in the 1940s the treatment of gonorrhea was revolutionized. But ever since that major victory gonorrhea has won several important battles. Gonorrhea developed resistance to sulfanilamide in the 1940s and to penicillins and tetracyclines in the 1980s. When I trained in internal medicine in the mid 1990s, Cipro (an antibiotic in the family called fluoroquinolones) was the preferred treatment for gonorrhea. In the 2000s some fluoroquinolone-resistant strains of gonorrhea appeared and by 2007 resistance was widespread. Third generation cephalosporins are now the last antibiotic family to which gonorrhea is susceptible. But, as a decade ago with fluoroquinolones, sensitivity to cephalosporins is slowly decreasing, especially in the western US. Though no strain in the US has become resistant yet, a strain isolated from a patient in Japan in 2009 was highly resistant to cephalosporins. The downward creeping cephalosporin sensitivity of gonorrhea prompted CDC researchers to sound the alarm in an editorial in the New England Journal of Medicine. The editorial warns that if the early signs of decreasing sensitivity are analogous to what we observed with fluoroquinolones in the '90s, then we may be only a few years away from strains of gonorrhea that are untreatable by any antibiotics. The authors make sound recommendations to accelerate development of new antibiotics and increase surveillance of gonorrhea antibiotic sensitivity. But it's entirely possible that these efforts will fail, and that the only defense against gonorrhea will be from a vaccine which is not expected any time soon. I've written before about the emerging problem of bacterial antibiotic resistance. Our grandchildren may study the period from the 1940s to the 2040s as the antibiotic century. 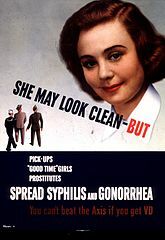 Unless antibiotic development stays a step ahead of the wily microorganisms we may reach a time when sexually transmitted infections are managed the way they were a hundred years ago – promoting the use of condoms and corny public health posters encouraging men to keep their flies zipped.